The Chiefs released tight end Gavin Escobar Saturday, only months after signing him to a one-year deal worth roughly $175,000 in guarantees. 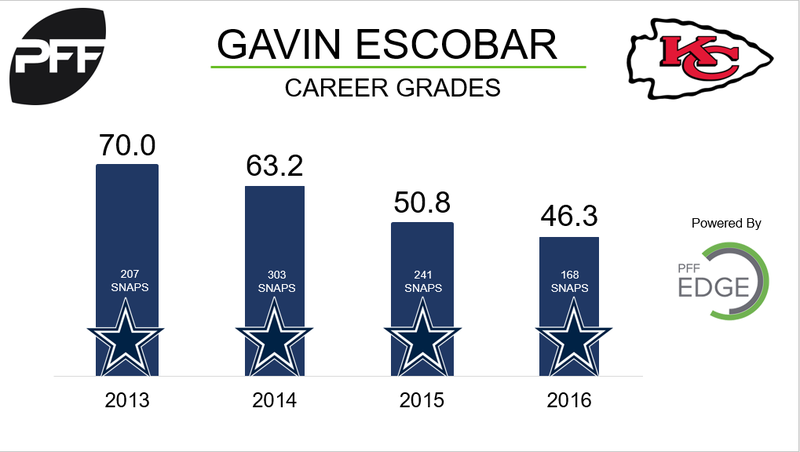 Escobar, a former second-round pick of the Dallas Cowboys, had fallen behind incumbent Ross Travis on Kansas City’s depth chart after catching only four of eight targets in 96 snaps this preseason. The signing of Escobar represented a bit of a projection for the Chiefs’ tight end group, as he never earned a PFF overall grade greater than 70 in his career, and his grade has decreased steadily since his rookie season of 2013.